The Java toLowerCase Method is one of the Java String Method which is used to convert the given string into Lowercase letters. In this article we will show you, How to use String toLowerCase in Java Programming with example. Before we get into the example, the basic syntax of the string.toLowerCase in Java Programming language is as shown below. The Java Programming provides two different method to convert the specified string into Lowercase letters. Following method will not accept any parameters and convert all the characters in a specified string to lowercase using the rule of default locale. Following function will accept Locale value as the parameter and convert the characters in a string to lowercase using the user specified locale. locale: Please specify the Locale you want to use while converting the String_Object characters to Lowercase. For example, English, Turkish, Latin etc. The Java string toLowerCase method is used to convert all the characters in a string to lowercase. 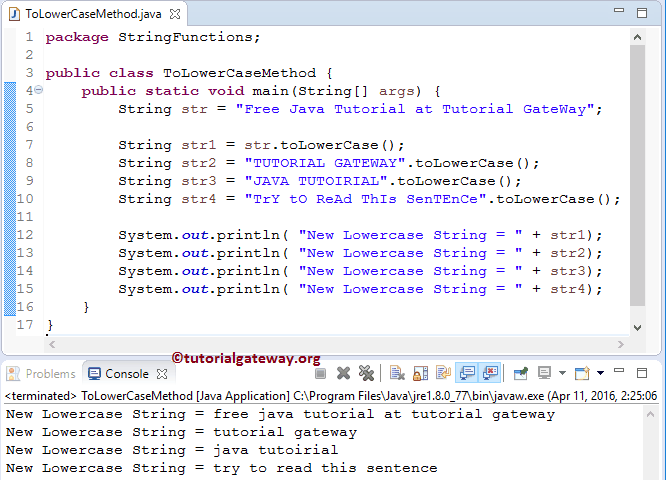 This Java program will help you to understand the string.toLowerCase method.